Healthy eating planners usually recommend a minimum of five servings per day of vegetables and fruits. Their strong impact on a healthy diet has been know for a long time. Unfortunately, people are slow to pick up on this important key to a healthy diet. Sadly, this may be the single most powerful resource you have to make a lasting impact on your health in general. The five-a-day strategy may be the single most effective approach to better health than you can use. It has been agreed upon for many years that there are an abundance of benefits to your health by eating vegetables and fruit. History has shown us time and again that the risks of some cancers, heart disease and an assortment of conditions and chronic diseases are lowered when we enrich our diet with vegetables and fruits. Sadly, upwards of 33% of all cancer mortality has point to diet as the culprit. Additionally, unnecessary cancer deaths are increasing due to diets that are low in vegetable and fruit content and high in fats. Nutritional importance isn’t the only advantage of vegetables and fruits. They provide a nearly unlimited variety to our daily meals and taste fantastic. With their variety of colors, flavors and textures they can be pleasantly enjoyed with almost every meal. Do you want to optimize you intake of fruits and vegetables? Then using them as garnishes and toppings in salads should become a daily habit. Did you know that foods like carrots, pawpaws, green leafy vegetables, peaches, mangoes, pumpkins and butternut squash are rich in beta carotene ( which is essential for healthy eyes and skin). They filled with necessary minerals and vitamins, not to mention an assortment of micronutrients. Did I mention great taste? You won’t find all of this in those prepackaged supplements. Vitamin C, not only a strong antioxidant but an important vitamin is found in most fruits and vegetables. Did you know that eating kiwi fruit, nectarines, broccoli, strawberries, citrus fruits and brussels sprouts could be so healthy for you? Another important antioxidant and vitamin, E, can be found in popular favorites avocadoes, broccoli, spinach and more. Obviously,everyone should focus on eating a healthy diet. 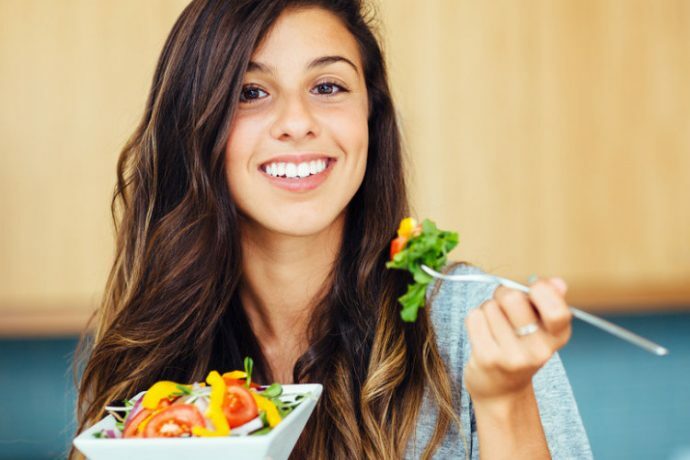 Women, however, have an even more important attraction to proper nutrition. It is vital to a healthy pregnancy, and some of the strongest health and nutrition requirements occur before the pregnancy is even discovered. During pregnancy, one of the most essential nutrients is folic acid. It is effective at preventing an assortment of birth defects, notably Spina Bifida. Brussels sprouts, broccoli, spinach and oranges are great sources for folic acid. As a result, and because of its’ importance during child bearing years, it is often included as a supplement in many common foods like breads and cereals. Fruits and vegetables are also rich in dietary fiber. The very same fiber that is essential in the prevention of some kinds of cancer and heart disease. Are you watching your weight? Did you know that in addition to all their other benefits, fruits and vegetables tend to be low calorie, low fat and high in nutrition. They contain very low levels of fat which is essential to effective, long term loss of weight. Additionally, they are lower in calories than most foods and contain no cholesterol. Is it any wonder that a diet rich in vegetables and fruits is at the top of the list of most dietary and nutritional experts? Delicious, nutritious and inexpensive. Buying them in season, locally can be the most effective way to save money and get the freshest quality of vegetables and fruits. As some vegetables and fruits go out of season, others are coming in and this provides a nearly uninterrupted variety every month. This also helps you to discover varieties you have not tried before. This aids in discovering new dishes and the prevention of “diet boredom”. Improve your overall health, up your level of fitness or help lose or maintain your weight, all becomes less of a challenge when vegetables and fruit contribute a significant part of your diet.